For Slash, getting back with Axl isn't worth the money - and we mean money! Still hoping to see the original Guns N' Roses? Better give up on that: Slash has revealed that he turned down 'hundreds of millions' for a reunion tour. "I don't think there's ever a chance of a reunion," the guitarist told GQ. "Things were so abrasive by the time I left, I've never thought, 'Oh, wouldn't it be nice to get back together.' Because I know it wouldn't!" Recalling his last Guns N' Roses tour with singer Axl Rose in 1993, Slash likened it to "an ongoing exercise in how we could bond the least. It just got worse and worse." The guitarist said that he has not spoken with Rose in 13 years. As for the actual amount he was offered to reunite the band, Slash said, "I can't remember exact numbers, but it's excessive. Oh, you know - seven, eight-digit kinds of things." When asked by GQ if the figure was in the hundreds of millions, Slash answered, "Yeah." 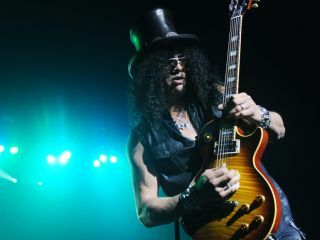 Even though he's still a member of the dormant Velvet Revolver (the band is currently searching for a new singer) and is about to release a much-anticipated solo album, the 44-year-old Slash said that it's "sad" that he and Axl Rose can't reconcile their differences. "When we were on stage we were a real force together," he said. "But it got to a point off stage where it was impossible for us to even be in the same room together and create any music. So it's sad that something so good doesn't exist anymore, even though we're both still alive and on the same planet. But that's all."